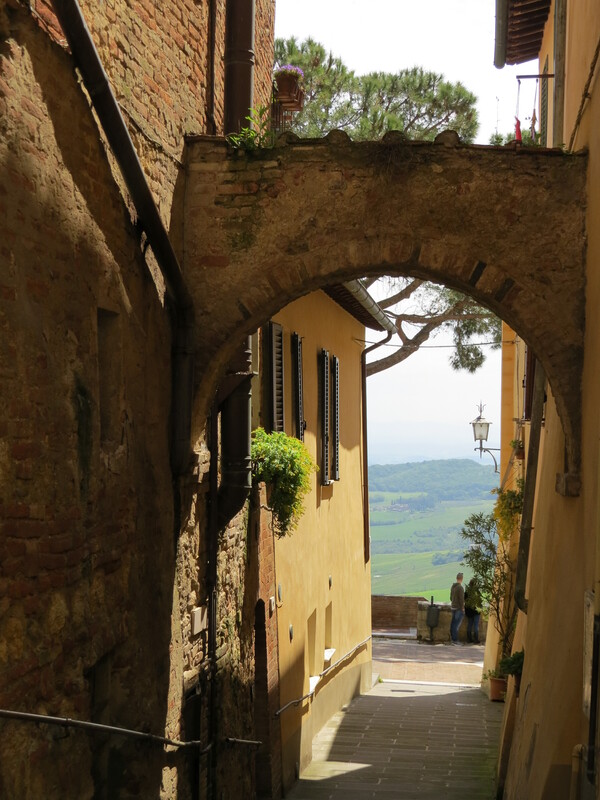 During our Paint Tuscany trip this May, we toured the beautiful hill town of Montepulciano. It was just as I had imagined it to be, but even more spectacular. A quaint little town of stone atop small hill with incredible views of the Tuscan valley below, Montepulciano also had unique stores, tucked along its streets, begging to be explored. 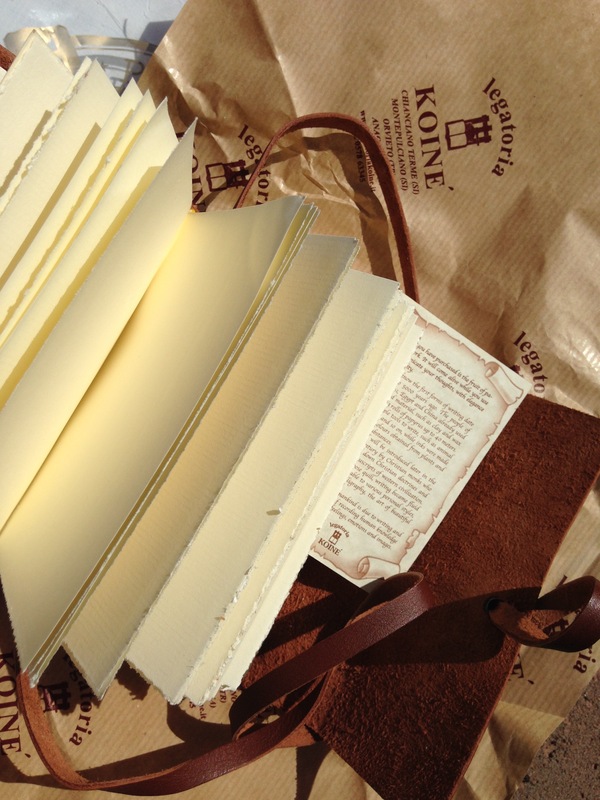 It was in Montepulciano where I found a hand-made book store, Legatoria Koine. Oh my. Such beautiful books! Such reasonable prices! I had to buy two. One for me (of course), and one as a gift (you know who you are!). Its heavy, torn-edged paper looks like old-time textured watercolor paper! I can’t wait to fill it with artwork! It smells like leather, has rough edges, and came with a little note tucked inside. The woman who waited on us was a beautiful late-20’s Italian girl, who bound all the books (and painted oils on the side!). So cute. Anyway, as we wound our way up through the town to take a look at the view as well as a garden near the top, I passed by a gorgeous alley, flooded in yellow Tuscan light, with views to the valley below. Breathtaking. This is one of three Tuscan paintings I worked on this weekend. Can you see why I was so inspired??!! And, weirdly enough, it wasn’t a terribly sunny day, but warm sunlight burst through the haze and flooded a golden glow to the wall. I painted this scene for several reasons. First, of course, to capture the gorgeous Tuscan light. 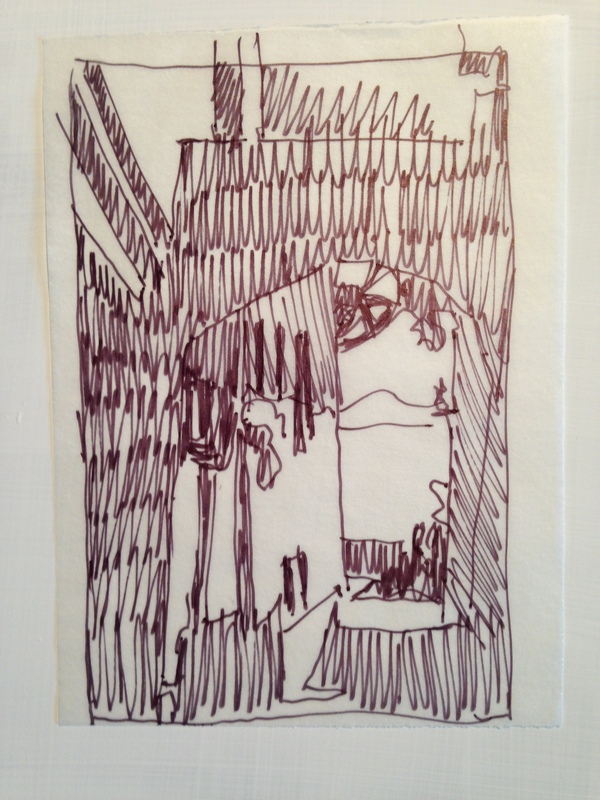 But I also love the archway and the dark foreground drawing us in to a misty Tuscan landscape. A couple pause to contemplate the valley view, which adds a human element to the scene. I am also drawn to the lamp on the wall to the right. I decided accentuate a triangular composition highlighting the window box, lamp, and people. With the composition focused on the 1/3 RH side of the canvas, here is my thumbnail sketch. Doing a small value sketch always help me decide on placement of shadows and forms within the painting. Sketching the basic outline, values, and layout of the alley. I gesso-coated rectangular paper cut out and collaged it onto my Plexiglas surface, haphazardly placing tiles of paper to resemble old brickwork. Netting further provided a gridded surface, suggesting rough stonework in the walls. As I painted, I sprayed and splattered water and paint on the surface, giving it an overall aged feel. A dark entry of warm stonework draws our eyes into the painting. We then dance along the shapes of window shutters, glance off a warm yellow wall, and find the couple enjoying the valley scene below. We then might find the lamp and pop back to the red flowers of the window box before contemplating deeper into the scene. 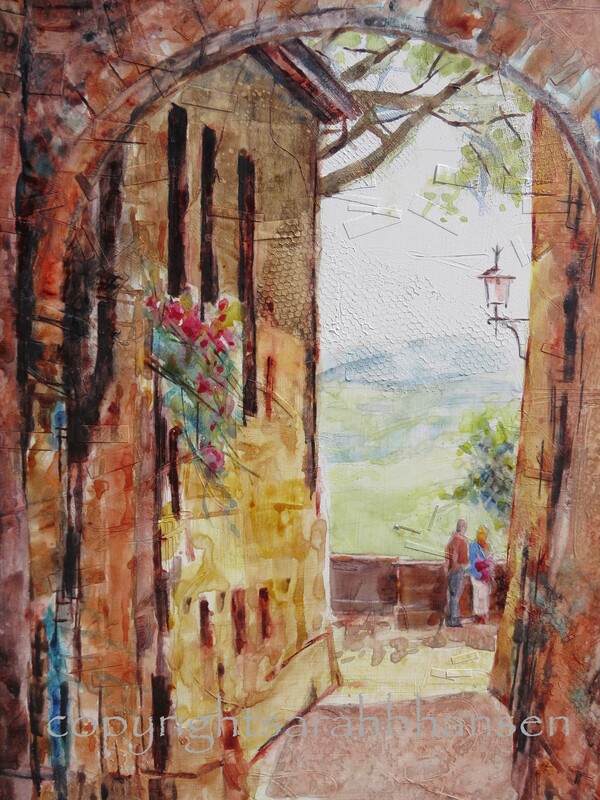 The resulting painting takes me back to my Tuscan experience and reminds me of our warm May day in Italy. I feel pulled in to the painting. I remember the cobblestone walls, stucco surface, rich smells, intimate windows, flowers, culture, and wonderful people. Imagine and allow it to draw you in to a beautiful moment in Montepulciano. Find my work at Tumalo Art Company. In July, I will have my Tuscan work hung on their walls!